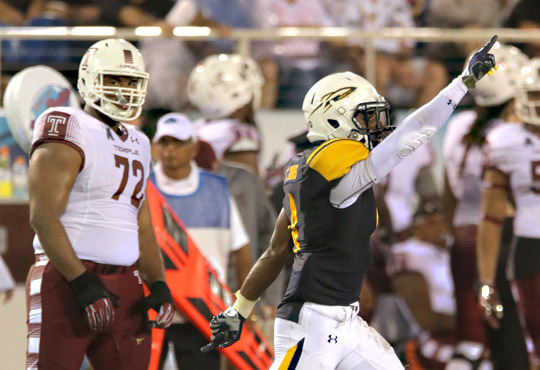 A pair of University of Toledo football players have been invited to attend upcoming NFL mini-camps. 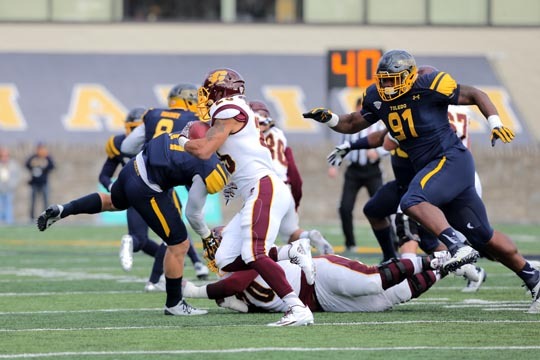 Safety DeJuan Rogers will attend the Chicago Bears’ mini-camp May 12-14, while wide receiver Corey Jones will attend the upcoming mini-camp for the Cleveland Browns. Rogers and Jones will have an opportunity to join four of their former Rocket teammates on NFL rosters. Running back Kareem Hunt (Kansas City Chiefs-third round), tight end Michael Roberts (Detroit Lions-fourth round) and defensive tackle Treyvon Hester (Oakland Raiders-seventh round) were selected in the NFL Draft, while offensive lineman Storm Norton signed a free agent contract with the Detroit Lions. Jones was a three-time All-MAC selection at either wide receiver or punt returner in his collegiate career. He ranks seventh on UT’s career ledger with 189 receptions and 2,236 receiving yards. He earned second-team All-MAC honors as a receiver in his sophomore season, catching 68 passes for 842 yards. As a junior, he caught 55 passes and earned first-team all-league recognition as a punter returner, leading the MAC with 10.2 yards per attempt. He made third-team All-MAC as a punt returner as a senior, averaging 9.6 yards per return and scoring one touchdown. He was a candidate for the Paul Hornung Award (nation’s most versatile player) and Biletnikoff Award (top receiver) as a senior. UT defensive tackle Treyvon Hester was selected by the Oakland Raiders in the seventh round of the 2017 NFL Draft Saturday, the third Rocket to be taken in the draft. Earlier in the day, tight end Michael Roberts was chosen in the fourth round by the Detroit Lions. 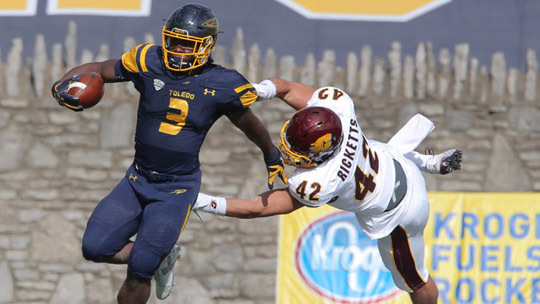 Running back Kareem Hunt was selected by the Kansas City Chiefs in the third round of the draft Friday night; read more here. Hester, a 6-3, 300-pound defensive tackle, is a three-time All-Mid-American Conference player who earned second-team honors in 2016. In his four-year college career, Hester totaled 153 tackles, 31.5 tackles for loss and 13.0 sacks. He was selected to play in the East-West Shrine Game, but he had to sit out due to an injury. Hester, the 244th pick of the draft, had been watching and waiting all day with friends and family until he finally got the call from Oakland. “I was getting a little discouraged. It was getting late, almost the end of the draft,” Hester said. “When I finally got the call, my heart almost stopped. It was almost as exciting as if I was taken in the first round. Hester, Hunt and Roberts are the first Rockets to be selected in the NFL Draft since John Greco and Jalen Parmele were selected in 2008. It also is the first time that three Rockets have been selected in the NFL Draft since the seven-round format began in 1994. UT had three players drafted in 1968 and four taken in 1963, an era when the NFL Draft had as many as 20 rounds. Roberts caught 45 passes for 533 yards and led the nation’s tight ends with 16 touchdown receptions, eight more than the next nearest tight end. 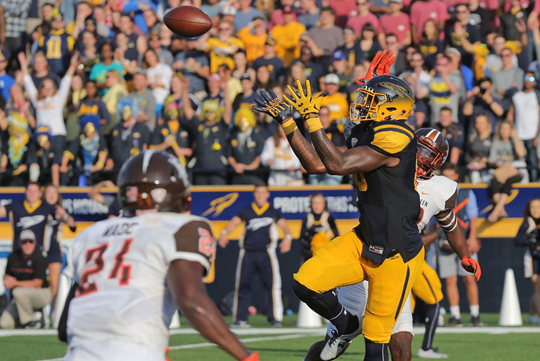 A first-team All-America selection by the Football Writers Association of America (FWAA), Roberts broke the Toledo record for touchdown catches in a season previously held by Lance Moore (14 in 2004). He shattered the school record for TD receptions by a tight end, formerly held by Don Seymour (9 in 1973). A first-team All-MAC honoree, Roberts had three TD catches in one game against both Western Michigan and Bowling Green. He played in the 2017 Senior Bowl and the East-West Shrine Game. “It’s a moment I’ll never forget,” said Roberts, who watched the draft with friends and family. “I think my mom is still crying. It’s amazing. I’m just very happy right now. The selection of Hunt, Roberts and Hester in the draft represents a huge accomplishment for the players and the program, said UT Head Coach Jason Candle. In addition, UT offensive lineman Storm Norton signed a free agent contract with the Detroit Lions Saturday immediately following the conclusion of the draft. Norton, 6-8, 306 pounds, is a two-time, first-team All-MAC selection at left tackle. 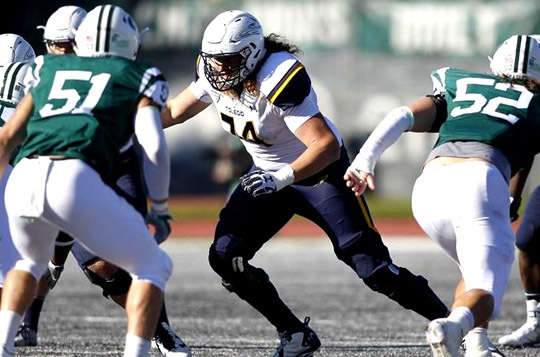 He was the leader of a unit that allowed just 14 sacks in 2016 and powered a Rocket offense that led the MAC in total offense (517.8) and passing offense (322.8). This past season he was on the official watch list for the Outland Trophy, awarded annually to the nation’s top interior lineman. He also was selected to play in the East-West Shrine Game. Norton has the chance to join former teammate Roberts, who was drafted by the Lions in the fourth round. Although he has never had a favorite NFL team, he is excited for the opportunity to play about an hour from his hometown. “Ford Field is just right down the road from my house and my family. I definitely appreciate that,” Norton said. UT senior running back Kareem Hunt was selected by the Kansas City Chiefs in the third round of the 2017 NFL Draft Friday night. Hunt, the 86th overall pick of the draft, is the first Rocket to be drafted since John Greco and Jalen Parmele were selected in 2008. Kareem Hunt is UT’s all-time leading rusher with 4,945 yards. 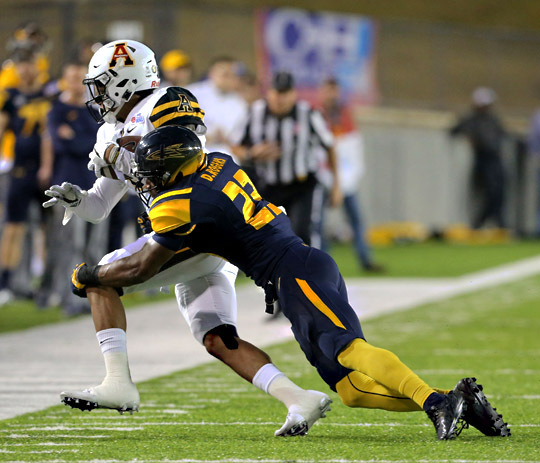 Hunt is Toledo’s all-time leading rusher with 4,945 yards and a three-time All-Mid-American Conference selection. He rushed for 866 yards as a freshman, 1,631 yards as a sophomore, 973 in an injury-filled junior year, and 1,475 yards as a senior. His career-high rushing game came at the 2015 GoDaddy Bowl when he gained 271 yards in a 63-44 victory over Arkansas State Jan. 4, 2015. Hunt also rushed for five TDs that game, tying a bowl record held by Barry Sanders of Oklahoma State. Hunt was named the Most Outstanding Player for the North Team at the 2017 Senior Bowl, rushing for 118 yards on 15 carries. He is the fourth highest draft pick in Rocket history behind Dan Williams (11 in 1993), Greco (65 in 2008) and Curtis Johnson (81 in 1970). Hunt said he is excited to be going to Kansas City. He spoke at length to Head Coach Andy Reid and Running Backs Coach Eric Bieniemy at the NFL Combine. With the Chiefs recent releasing all-time rusher Jamaal Charles, an opportunity has opened up in their backfield. 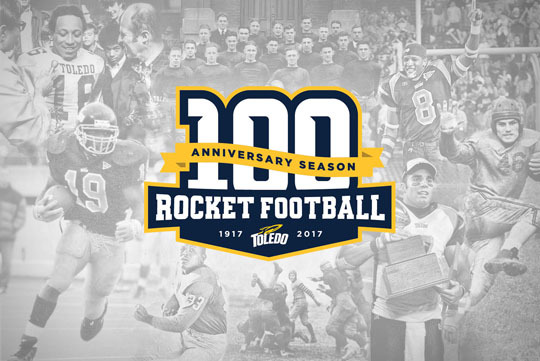 The University of Toledo recently revealed the ballots for fans to vote for its All-Century Team and its All-Time Greatest Victories as part of the 100th anniversary celebration of Rocket Football. Fans can vote for the All-Century Team and All-Time Greatest Victories beginning Monday, May 1, through Monday, May 15. Fans may vote online at the official UT Athletics website, UTRockets.com. Fans may only vote once. Write-in votes for any player or game not on the ballot are welcome. Rules for voting are available at UTRockets.com as are the list of biographies for All-Century Team candidates and All-Time Greatest Victory list. The All-Century Team will include the top 50 Rockets of all-time, going back to the first season of organized football at UT in 1917. The All-Time Greatest Victories list will include the 10 greatest victories in Rocket history. The All-Century Team and All-Time Victory list will be unveiled via social media throughout the summer during a 100-day Countdown to Kickoff, culminating Thursday, Aug. 31, the date of Toledo’s home opener vs. Elon. The All-Century Team will be honored Saturday, Sept. 16, during the Rockets’ game vs. Tulsa. The University of Toledo (then known as Toledo University) first fielded a football team in 1917 when a group of 13 students asked Professor John Brandeberry to serve as their head coach. The team adopted the nickname Rockets in 1923 and moved to its current home in the Glass Bowl in 1937. In their 100-year history, the Rockets have won 526 games and 10 Mid-American Conference Championships, and have appeared in 16 bowl games. The Rockets will open the 2017 season with a Thursday night home game vs. Elon at the Glass Bowl Aug. 31. In an effort to reduce vehicle congestion, promote alternative transportation, and move toward more equitable pricing for parking, there will be a number of changes made to parking beginning fall semester. These modifications were developed with input from nearly 5,000 students, faculty and staff in a parking survey conducted last December. • Freshman residential (Scott Park Lot 21), $100 per semester. • Lot 22 on Scott Park Campus. In addition to the change in parking permit rates, which freezes student fees as UT moves toward a more equitable system, vehicle owners will be required to display printed permits to show that their vehicle is registered. “There have been no increases in parking rates at UT for more than 10 years, despite parking being one of the only budgetary items that has no other funding source, such as state subsidies,” Kelley said. Additional information about the new parking system will be shared as more details are finalized in the coming weeks. Organizers of the Holi Toledo celebration at The University of Toledo have canceled the event this afternoon due to the weather. Holi Toledo, an all-campus celebration of the Indian holiday Holi, was scheduled to take place from 3 to 5 p.m. Thursday, April 27 on the grounds outside Memorial Field House on Main Campus. This year’s event had already been postponed once. Last week, thunderstorms forced organizers to push the event back to today. With finals next week, there is no plan to reschedule the event this semester. The annual event features students throwing colored powder, as well as music, dancing and a T-shirt giveaway sponsored by the Center for International Studies and Programs. Holi Toledo was the brainchild of Dr. Jeanine Diller, former director of the Center for Religious Understanding. The event, which draws on the festivity, color and seasonal meaning of the holiday, has the blessing of the Hindu Temple of Toledo. “Holi Toledo also serves a more immediate purpose here in the UT community, which is to highlight our diversity, promote unity, and foster improved understanding of the religions represented on campus,” Miller said. The University of Toledo Department of Communication, in cooperation with the UT Department of Intercollegiate Athletics, will mark its 100th ESPN3 production Saturday, April 29. The landmark broadcast will be the Rocket softball team’s game vs. Western Michigan. UT first began producing games for ESPN in October 2015 as part of an agreement between the Mid-American Conference and the worldwide leader in sports. Unlike many of the other MAC schools, however, UT was able to build upon the longstanding relationship between its Athletic Department and the media production component of the Department of Communication to create an academic-driven means of producing game broadcasts. This initiative was led by the late Don Reiber, UT director of media services and faculty member in the Department of Communication. 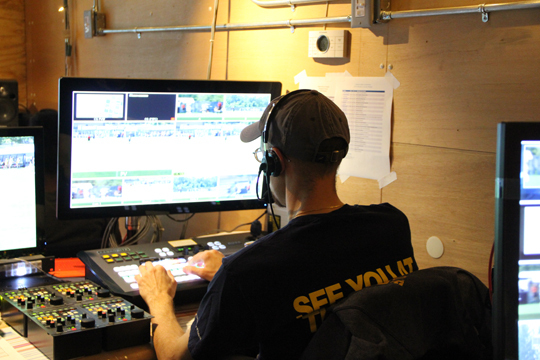 Reiber developed a Live Web Streaming course that would provide the students needed to serve as the eight- to 12-person technical crew for each ESPN3 production, as well as the numerous football and basketball games that were already being produced for the Glass Bowl and Savage Arena’s live video board audiences. 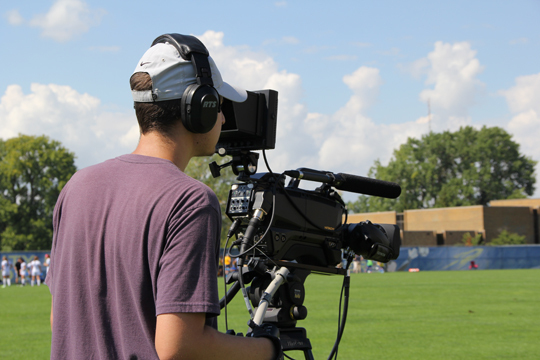 Student Adam Stoddard ran the camera for one of six women’s soccer games in 2016. 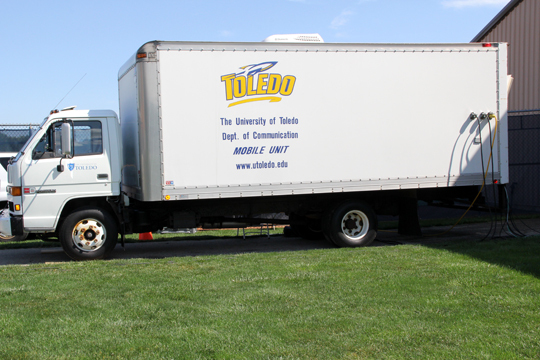 Over summer 2015, the Department of Communication and the Athletic Department pooled resources, investing in new equipment to outfit an existing television production truck owned by the Communication Department that had been unused for several years. Seeing both the academic potential and the opportunity to reach a much larger audience, UT’s administration authorized the creation of two new staff positions to support the endeavor. UT hired John Eidemiller, who previously had been a media producer in the Department of Communication, into a new role as executive producer for ESPN and athletic video productions, as well as UT alumnus and former WTVG 13 ABC executive director Jonathan Mondelli, into the role of technical director. Unfortunately, in September 2015, just weeks before the first scheduled UT-produced ESPN3 broadcast, Reiber passed away unexpectedly. Determined to still meet the broadcast schedule that they had set weeks before, Eidemiller and Mondelli pressed on, completely rebuilding and rewiring the production truck in less than two weeks with the help of Meagan Dietz, who was then a junior majoring in communication, and getting all of the newly received equipment configured in time for the first scheduled production, a UT volleyball game vs. Western Michigan. Jonathan Mondelli directed an ESPN3 women’s soccer production. The class has changed somewhat. Eidemiller has taught the Live Sports Production for each of the four semesters since taking it over following Reiber’s death, and has refined it each time to address the goals of the students, but he said that at the core, the principle remains the same. In addition to the complement of women’s soccer and women’s volleyball games in the fall, men’s and women’s basketball in the winter, and baseball and softball in the spring, Eidemiller and Mondelli are planning to increase coverage to include women’s swimming and diving in the 2017-18 academic year, and are exploring the possible addition of tennis down the road. All UT-produced ESPN3 games are available online at watchESPN.com or on mobile devices through the ESPN app. For a full schedule of games, including a listing of available TV viewing options, visit UTRockets.com and search by sport. Students interested in becoming part of the production crew are encouraged to contact Eidemiller at john.eidemiller@utoledo.edu or Lisa Bollman, academic adviser in the Department of Communication, at lisa.bollman@utoledo.edu. The solar eclipse set to occur this summer will be prominently featured at the sixth annual Astronomy Day celebration hosted by The University of Toledo. The free, public event, which will start at 1 p.m. Saturday, April 29, in Ritter Planetarium, will include hands-on, family-friendly activities for kids, UT astronomers sharing their latest research, shows in the planetarium, and a chance to look through the largest optical telescope in the Midwest. • An open house to tour Ritter Observatory at 9 p.m. Weather-permitting, guests will have the chance to look through UT’s 1-meter telescope, the largest optical telescope in the Midwest. Members of the Toledo Astronomical Association will be available to answer questions about telescopes and provide solar observing, weather permitting. Join thousands of others by taking to the streets Saturday, May 6, for the 11th annual Making Strides Against Breast Cancer walk to help the American Cancer Society end the pain and suffering of those with breast cancer. The 5K walk will take place at the Town Center at Levis Commons in Perrysburg. Registration will open at 8 a.m. with the walk beginning at 9:30 a.m.
Before the walk, an opening ceremony will take place to help inspire participants to take action as well as to symbolize the uplifting and energizing commitment people have made in making sure that no one has to face breast cancer alone. Last year, more than 5,000 participants raised more than $130,000 for cancer research. The money raised was able to support programs to fight breast cancer in areas such as research, education, advocacy and patient services. So far this year, 1,600 participants have raised more than $154,000. Giovanoli serves as a co-chair for the event, but also has a deeper connection to the walk as she herself is a two-year breast cancer survivor. The walk also will honor Renee Schick, manager of Renee’s Survivor Shop in the Eleanor N. Dana Cancer Center, as this year’s honorary survivor. She is celebrating 16 years as a breast cancer survivor. A limited number of T-shirts will be available at the event for $20. Parking will be free at the Town Center at Levis Common. The parking lots on the back side of the mall also will be available for participants. The University of Toledo has a team called Rocket to a Cure, and people are encouraged to register for it. Rocky and Rocksy also will be in attendance. The walk is family-friendly, and there is no registration fee to sign up. Participants are encouraged to fundraise or donate, but are not required. UT Health will sponsor a photo booth for Making Strides Against Breast Cancer. To sign up for the event or to donate, click here. 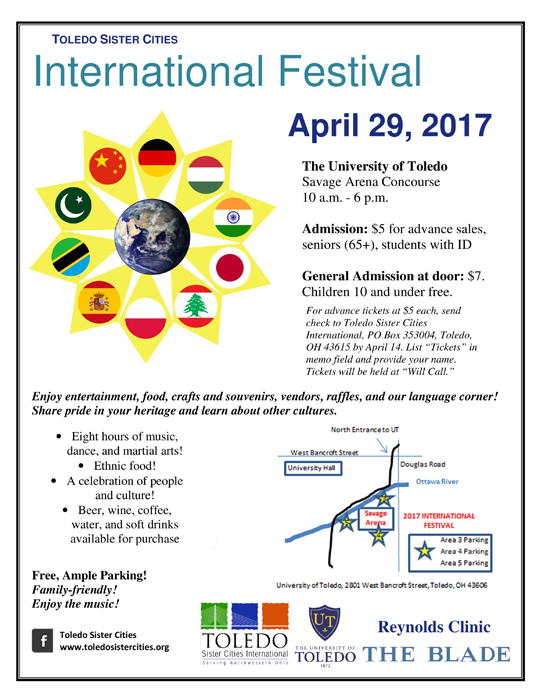 The eighth annual Toledo Sister Cities International Festival will be held Saturday, April 29, from 10 a.m. to 6 p.m. in Savage Arena. Participants will have the opportunity to learn about and experience cultures from around the world. The event will start with a parade of nations at 10 a.m. After that, there will be an opportunity every 30 minutes for participants to learn a little bit of a different language including Urdu, Arabic and Hungarian. Ethnic food and crafts will be available for purchase. Last year, more than 3,000 people attended the event that featured music, dance, and the celebration of people and diverse cultures. Admission is $5 for seniors 65 and older and students with their ID; $7 for general admission; and free for children 10 and younger. For more information, visit toledosistercities.org.